I watched President Obama’s speech on jobs last night. It stirred something very emotional in me. It wasn’t because the speech was so wonderful, though I thought it was one of Obama’s better oratories, but perhaps because I too am unemployed. I was laid off last May from a job that I worked at for four years. I performed the job with excellence, always achieving the highest raise in my yearly reviews, and winning the praise and respect of my coworkers and bosses. It wasn’t a great job; it paid poorly, and there was little room for advancement, but it did cover my bills and provided me stability in a fierce economic climate of doom and gloom. I also naively thought the job was recession proof because of my low pay and high competence, but like millions of others, I was laid off because they claimed that they couldn’t afford to keep paying my health insurance. At least that’s what I was told. Obama’s speech last night moved me, and I hope his leadership is strong enough to see it through, but the insane political circus of the day fills me with doubt. Politically, I believe in great leaders. I believe in leaders who can inspire and touch the masses with truth and courage. I believe in leaders who demand excellence from themselves and excellence from their country, and the world. I believe in leaders who feel heavily the weight of the awesome powers they seek, and who knowingly carry the terrible responsibility such powers demand once they possess them. This is why Robert F. Kennedy is my hero. He represented all of those things, and elevated political discourse into poetry of the highest magnitude. He embraced all people, and never spoke down to any audience. He also never pandered to audiences, as he was unafraid to tell them the truth even if it made him more unpopular. 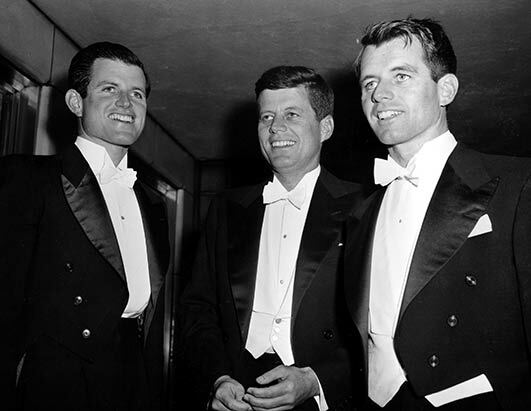 The more I learn about Robert F. Kennedy, the more sad I become contemplating his senseless killing. What’s amazing is that Robert Kennedy felt this same sadness when Martin Luther King Jr. was brutally assassinated. Not only did he feel sadness, he felt a responsibility to face a justifiably irate crowd of black Indianans and offer what little solace he could. He didn’t speak down to them, or tell them that rioting or thoughts of revenge were wrong, instead he persuaded them to examine the tragedy not through a prism of violence, but through a prism of peace. Eluding to his brother John’s death for the first time in a public forum, he quoted the Greek poet Asechylus, “even in our sleep, pain which cannot forget, falls drop by drop upon the heart, until in our own despair, against our will, comes wisdom, through the awful grace of God.” His entire speech was unprepared and eloquent beyond any other leader’s ability. I think if he lived, and was elected president, he could have been another Lincoln. Sadly, his greatest bond with Lincoln, was his untimely death brought about by the bullet of a madmen. 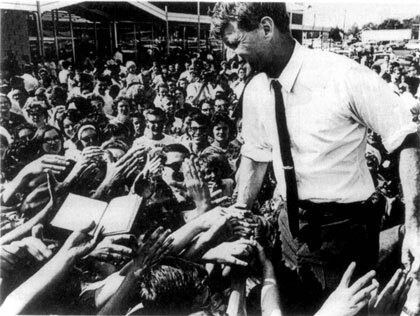 Enjoy this video of Robert F. Kennedy, and expect another update on the man tomorrow.